You are unique and so is your smile. You deserve a unique orthodontic care plan that’s right for you. Dr. Nicholas Rafaill and the team at Straight Smiles Orthodontics deliver efficient, timely, and affordable care that will change your life. Having straight teeth and a beautiful smile will transform all parts of your world. No longer will you be ashamed of crooked teeth, afraid to smile for fear of what others might think. Once you’ve completed treatment, you’ll have an incredible, radiant smile that will last a lifetime. Every day we witness positive changes in our patients. People who were once reluctant to smile begin to do so openly and with confidence. Their self-esteem grows by leaps and bounds, as they see their new smile emerge. By the time we remove their braces, our patients are outgoing and confident in social situations; happily engaging with others, smiling and laughing with ease. We’d love to help you transform your life and smile, too! Many people think that orthodontic treatment is only appropriate for children and teens. Nothing could be further from the truth. While you most often see metal braces on younger orthodontic patients, today’s techniques include virtually invisible options. Straight Smiles Orthodontics is pleased to offer Invisalign® clear aligners and ClearCorrect™ clear brackets. These allow us to shift your teeth into proper alignment, with no one knowing you’re doing so! What your neighbors, friends, and coworkers will notice is that you’re smiling a lot more often, with confidence. Orthodontic treatment involves trust and partnership: you need to know we have your best interests at heart, and you need to be actively involved in your home care. We can’t create a new smile without you. 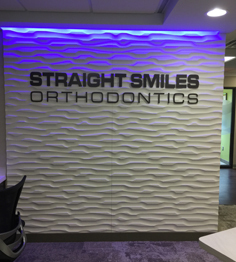 Straight Smiles Orthodontics offers complimentary consultations in Shelby Township, MI. We welcome patients from Macomb, Utica, Sterling Heights, New Baltimore, Clinton Township, Chesterfield, Romeo, and the surrounding areas. Please call to schedule your consultation, today. We look forward to starting you on the life-changing path to a new smile, one filled with confidence.